For me, Soda bread’s a true winner: Yeast and hassle free (no sweat provoking kneading required), you can have a batch in the oven within 10 minutes. Genuinely. It’s so quick in fact, I’ve adjusted, binned and tweaked this ambitious (for someone who doesn’t make bread) combo countless times. I’m now ready to disclose. Preheat oven to 190C / 375F / Gas 5. Sieve dry ingredients into a large bowl and mix to a soft dough with the milk. The dough should be slack but not wet. 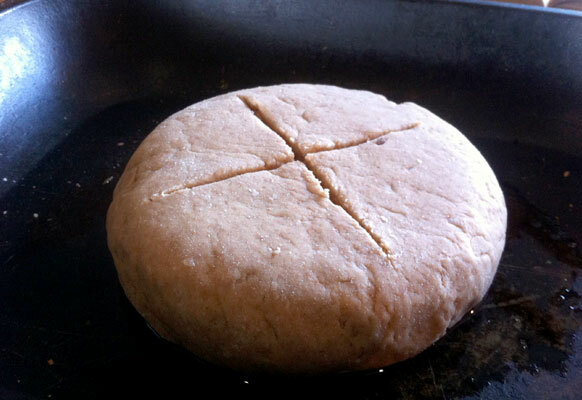 Knead until smooth, form into a ball and flatten dough to 3 – 4” thick. Put on a greased baking tin and score a large cross o the top. Bake in the pre-heated oven for 35 – 40 mins. The bread should still be quite moist in the centre due to the tahini so a knife shouldn’t come out clean. If you over cook, the bread will become dry quickly after cooling. 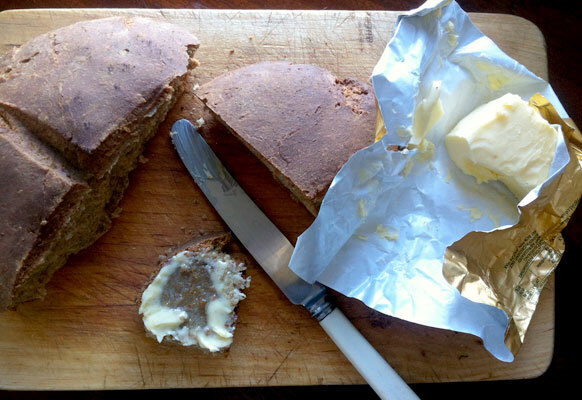 Serve warm or toasted with good, salty butter and soup. 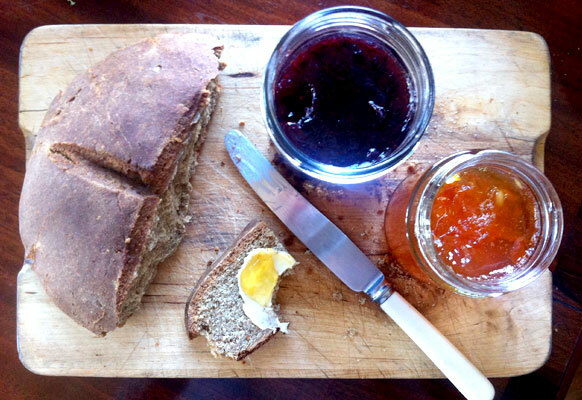 Or with Mum’s Seville orange marmalade. 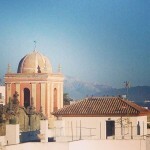 Following on from last week’s post The jam co-operative, here’s the promised 1929 recipe for Seville orange marmalade. 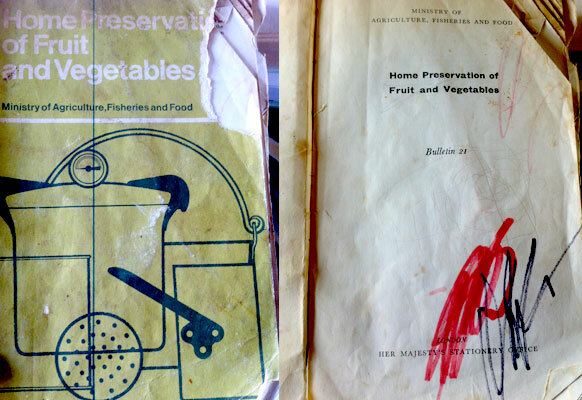 Taken from The Ministry of Agriculture Fisheries & Food, HMSO Bulletin 21: Home Preservation of Fruit & Vegetables. Tested, tweaked, tasted and approved by Mum Garcia. Scrub, scald and peel the fruit. 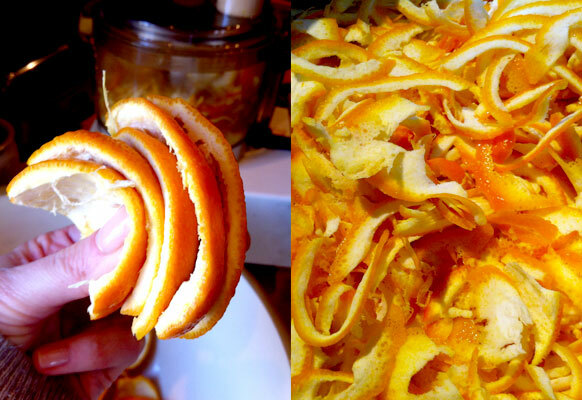 Put the shredded peel, acid and half the water in a jam pan (I use lemons and grate some peel into the pan too). Bring to the boil and simmer gently for about 2 hours or until the peel is tender. Add more water if you think it’s needed. 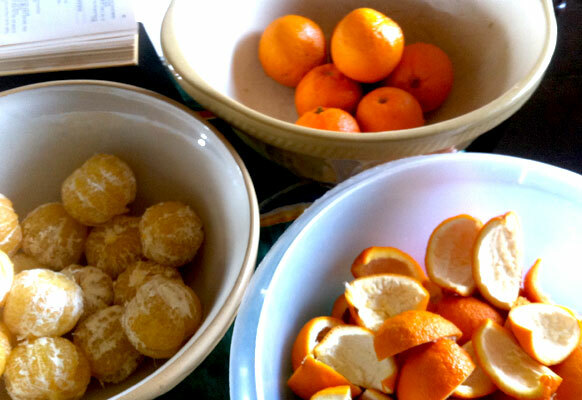 Cut the rest of the fruit and pith coarsely. Simmer with the rest of the water in a closed pan for 1.5 hrs then strain through a colander. Alternatively, rub the pulp through a fine sieve for a very thick marmalade. Add the strained pulp to the peel, bring to the boil and cook off excess water if necessary. Add the sugar, stir until dissolved then boil rapidly until setting point is reached. To test: Put a tsp full onto a plate and allow to cool slightly. If the jam wrinkles when you press gently with your finger, it’s ready. 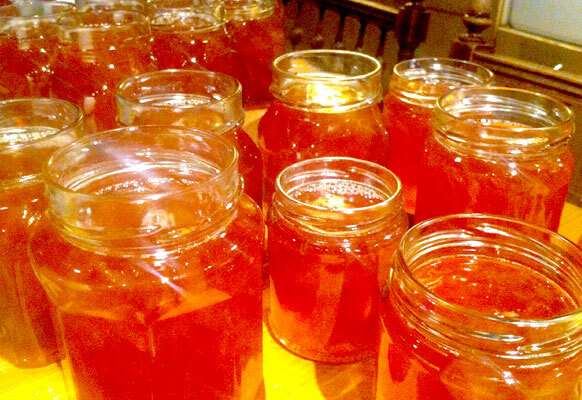 Remove the scum from the top, allow the marmalade to cool slightly and pour into warm jars – cooling prevents the peel from rising in the jars. Cover with waxed circles while still hot and tie down when cold. 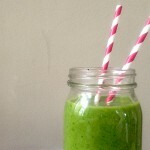 If using plastic or metal lids, sterilize by boiling for 5 mins first and screw on immediately. I had an early induction on street food. Pioneering in nutrition, my mum would pitch up in a salubrious Black Isle (a peninsula on the Scottish Highlands) square every Saturday to sell home grown fruit and veg. Decent varieties of which were harder to come by without the use of the Inverness ferry (and a very long queue) in the, ahem, 1970s. Not limited just to veggies, I’d help mum sell our home-made jams, chutneys, marmalades and spun wool (I kid you not) from the neighbour’s burger van. The rest of the week Pat would use said vehicle to supply highlanders with gourmet venison burgers; you see, we Scots don’t just eat deep fried Mars bars! In those days street food was somewhat less en vogue; one well-heeled village resident promptly enlisted the local bobby to deal with the mobile people. I can only imagine the shame at Granny Mac’s charity lunches; wasn’t procreating with a Spanish drummer rogue enough? Mindful of his duties, our diligent PC promptly marched over to Mrs Garcia-Macintyre and with a broad Scottish accent, and a hint of a chuckle, demanded a passion fruit. One area where Rebel Garcia and Matriarch Macintyre et al saw eye to eye though, was on the caliber of preserves we purveyed. 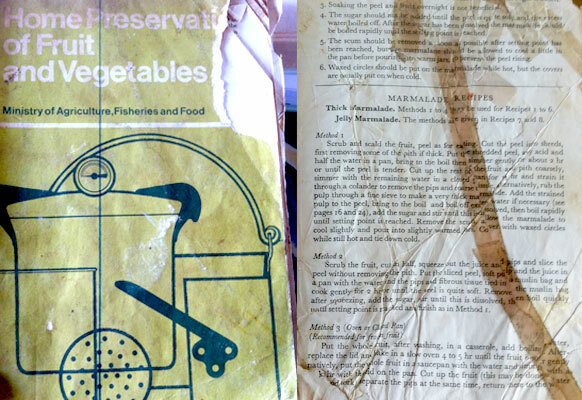 With the help of a 1929 MAFF guide, mum’s marmalade at least, has never been cause for debate. Mrs Garcia now serves her wares, along with Netherton Farm eggs (more free-range than I feel is entirely necessary) with Wild boar cross Tamworth sausages and bacon at B&B Netherton Farm. 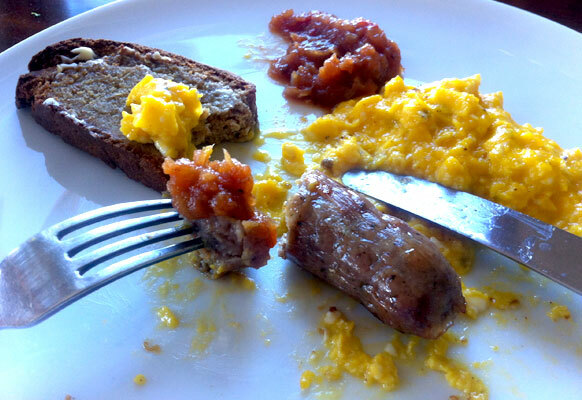 My Home-made soda & tahini bread, Wild boar cross Tamworth sausages, Netherton Farm eggs and Mum’s chutney. It’s getting a little late in the day but you should still be able to get your hands on Seville oranges for MAFF Marmalade next week.